I have to say I am totally blown away by the new BIN.GO by Skip*Hop. We already know they are an amazing company based on their current line of products, but these top the list. If you're anything like me, no matter how hard you try to keep the toys, books and clothes in their designated rooms, somehow by the end of the day they are strewn across the entire house. The BIN.GO storage basket is the perfect solution..
"Our soft-canvas catch-all is strong and stylish: tough enough to hold tons of stuff, and chic enough to complement your playroom or nursery." 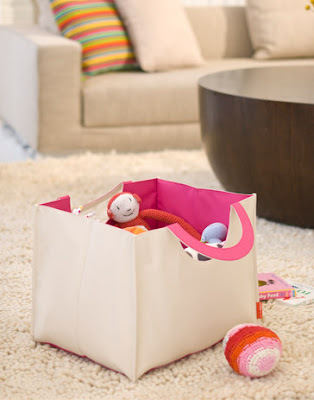 It is space efficient, holding anything from toys to shoes, it folds flat to store away when not in use and (my favorite part) it's large circle handles fold up for you to carry from room to room, the store or even to grandma's house. Available in tabletop or large sizes and a variety of pleasing color combinations. Love it. It might be a great storage solution for our new playroom! I LOVE them. All around perfect. so it's not as sleek...doesn't have the handle or the colorful inside, but i got some of those fabric storage cubes from target the other day and this is how we use them...the put toys in. $5.